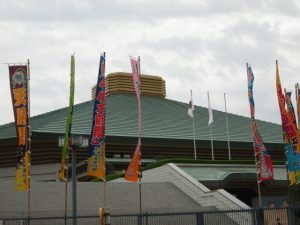 Speaking of Ryogoku, it is sumo wrestling and Ryogoku Kokugikan! You will find many sumo stables when walking around here, and often pass by wrestlers in a yukata style. 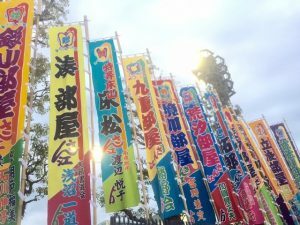 While Grand Sumo Tournament is being held, there are a lot of flags, called “nobori”, around Ryogoku stations, and many people visiting to watch the tournament, as well as stable masters, assistants in the stable and wrestlers ranked in lower division. The number of sumo wrestlers is about 700. Although wrestlers ranked below Makushita have a sumo bout every other day, the sumo wrestling matches are scheduled every day from the morning to the evening while the tournament is being held, on the same sumo ring, called “dohyou”. Each tournament lasts for 15 days in Tokyo and in other large cities such as Nagoya, Osaka and Fukuoka. Since the history of sumo are originated in the shinto harvest festivities, the sumo wrestling seems to be in a different field from other sports. 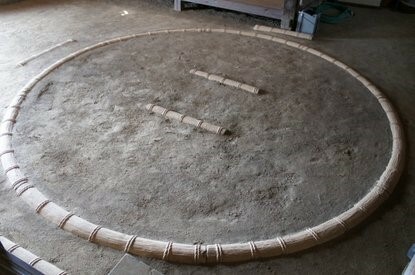 However, the globalization of sumo wrestlers is progressing now, and in fact, world competitions are also taking place. Nowadays, it’s rare that Japanese sumo wrestler wins the competitions and the tournament as well. 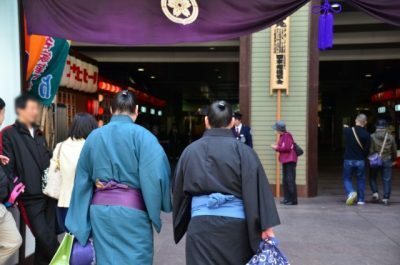 Even though it is a historical culture of Japan, it changes as time goes by and I think that flexibility to accept the changes is also a unique Japanese culture. As a Japanese, it is interesting to see sumo wrestling as sports spreading to the world while keeping the rituals and customs on the ring. 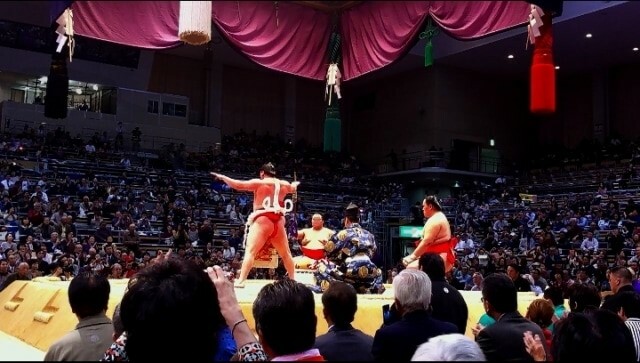 SNS, information diffusion tool of image and voice, has introduced not only sumo wrestling but also various cultures that have developed and have been protected in Japan, to all over the world. As the result, the number of people who have an interest in different culture gradually increased. Yet, information diffusion tools will continue to increase and more people around the world are surprised about the Japanese culture. It may be a reason why many people visit Japan. ← How do you spend your free time at Narita Airport?